f your worksheet has a lot of columns, you can use the Scale to Fit options to reduce the size of the worksheet to better fit the printed page. 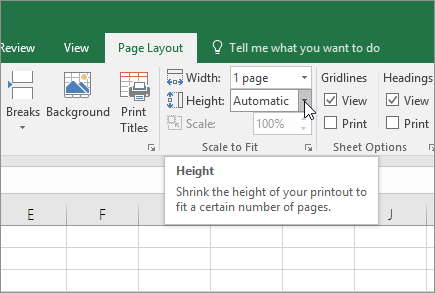 To print your worksheet on a single page, choose 1 page in the Height box. Keep in mind, however, that the printout may be difficult to read because Excel shrinks the data to fit. To see how much scaling is used, look at the number in the Scale box. If it's a low number, you may need to make other adjustments before you print. For example, you may need to change the page orientation from portrait to landscape or target a larger paper size. For more information, see the section below to understand a few things about scaling a worksheet to fit a printed page. To print your worksheet, press CTRL+P to open the Print dialog box, and then click OK. If your worksheet has many columns, you may need to switch the page orientation from portrait to landscape. To do this, go to Page Layout > Page Setup > Orientation, and click Landscape. Consider using a larger paper size to accommodate many columns. To switch the default paper size, go to Page Layout > Page Setup > Size, and then choose the size you want. Use the Print Area command (Page Setup group) to exclude any columns or rows that you don't need to print. For example, if you want to print columns A through F, but not columns G through Z, set the print area to include only columns A through F.
You can shrink or enlarge a worksheet for a better fit on printed pages. To do that, in Page Setup, click the window launcher button. Then, click Scaling > Adjust to, and then enter the percentage of the normal size that you want to use. Note: To reduce a worksheet to better fit the printed pages, enter a percentage that is smaller than 100%. To enlarge a worksheet to fit the printed pages, enter a percentage greater than 100%. Page Layout view isn't compatible with the Freeze Panes command. If you don't want to unfreeze the rows or columns in your worksheet, you can skip Page Layout view and instead use the Fit to options on the Page tab in the Page Setup dialog box. To do that, go to Page Layout tab, and in the Page Setup group, click the Dialog Box Launcher at the bottom-right side. Optionally, press ALT+P, S, P on the keyboard. To print a worksheet on a specific number of pages, in Page Setup, click the small window launcher button. Then, under Scaling, in both of the Fit to boxes, enter the number of pages (wide and tall) on which you want to print the worksheet data. Excel ignores manual page breaks when you use the Fit to option. Excel does not stretch the data to fill the pages. When you print an Excel worksheet, you may find that the print font size is not what you expect. Follow these steps to scale the worksheet for print by increasing or decreasing its font size. Click Page and in the Adjust to box, choose a percentage by which you want to increase or decrease the font size. Review your changes in Print Preview and—if you want a different font size—repeat the steps. In Print Preview, if the worksheet appears to be reduced to a single page, check if a scaling option like Fit Sheet on One Page has been applied. Refer to the section above to learn how to make adjustments.